Cheri- It doesn’t seem to matter how much time we have for a challenge, I seem to always wait until the last minute to complete it. Over the years, I’ve collected several chairs that need to be painted/redone. I started with 3 chairs that I’ve had for a while and decided to try a different technique on each one. If I didn’t like how my chair was coming along, I’d move on to a different one. The camp chair was my third try. It was a garage sale find and was a lot more unique than my other attempts. The bad part of the project, was that the canvas needed to be replaced. 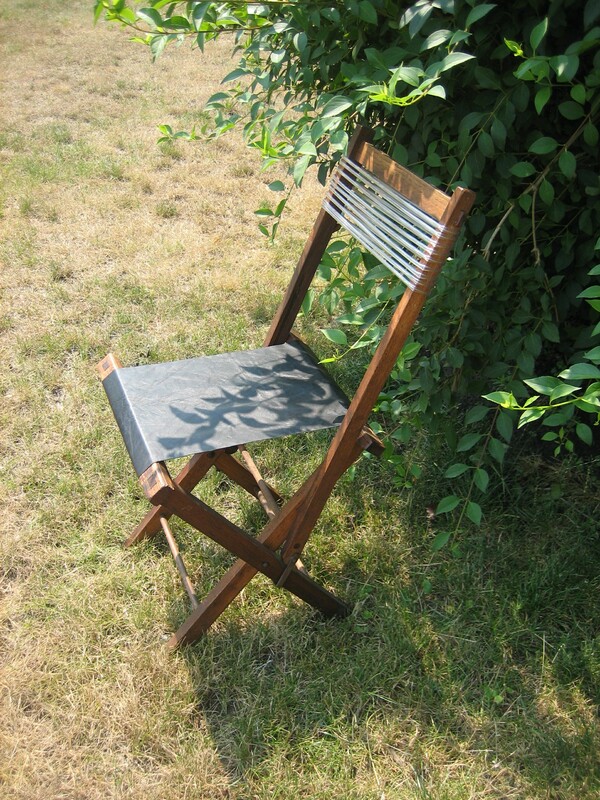 For a folding chair, this is a pretty major fix as the chairs stability depends on the canvas seat and the back. After pulling off the canvas, I was amazed by the wonderful wooden skeleton the chair had. of course now I was faced with the daunting task of showing off the chair without covering it up too much. After mulling it over in my head for a bit, I decided that something transparent would be best for the back. It just happened that I picked up some unused medical tubing at another garage sale that would be perfect for the back of the chair. I dremelled about 12 holes on each side of the back. Then I took the tubing and wrapped it around the chair, tacking it in each place that had previously been drilled. The back of the chair looked great, next came the seat. I first tried to use the tubing again, but the tubing needs to be held tight and this chair folds. I had some leather in my material stash and dug it out. It was a perfect fit to replace the canvas seat of the chair. It needs a few more tweaks, but the finished product came out pretty cool. Thank you. It was a lot of fun.